'Tokens Remaining' is how many recording tokens are left for the current billing cycle (one per recording). The allowance is refreshed at the start of each subscription month. 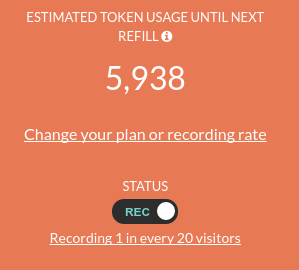 This shows how many recording tokens are left for the current billing cycle. The allowance is refreshed at the start of each month. The graph show shows your daily recording numbers for the past two weeks. The dashboard shows an estimate of how many tokens will be used by your next monthly refill. You can also click to change your settings, and turn off Hindsight. This shows a list of recent recordings. Recordings can be viewed by clicking on a row. For a longer list of recordings go to the 'Recordings' tab on the Hindsight sidebar.